KL’s Most Happening Place is Where Saturday Nights Begin! 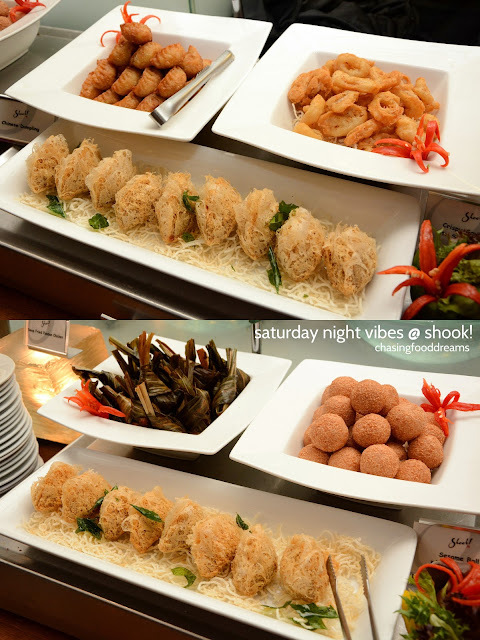 Something is happening every Saturday night in town and it’s a delicious one… if food and music are your loves, then head over to Shook! at Feast Village, Starhill Gallery. There’s nothing better on a Saturday night than to spend it over an unforgettable feast with lots cocktails and wine plus a live band performance to jazz up the evening! Every Saturday night, diners will be seeing a different performer of note taking the stage with original music and mesmerising renditions of well-loved tunes. The first to join the hand-picked Saturday Night Vibes line-up early this month was FAZZ, a Malaysian band known for its soulful jazz vibes. In the weeks to come, Shook!’s guests can expect to be serenaded by the likes of Evelyn Feroza (August 26), Nadir (September 9), Reza Salleh (September 16), Jumero (September 23), Bihzhu (October 14), and Ryot Jones (October 21) to name a few. 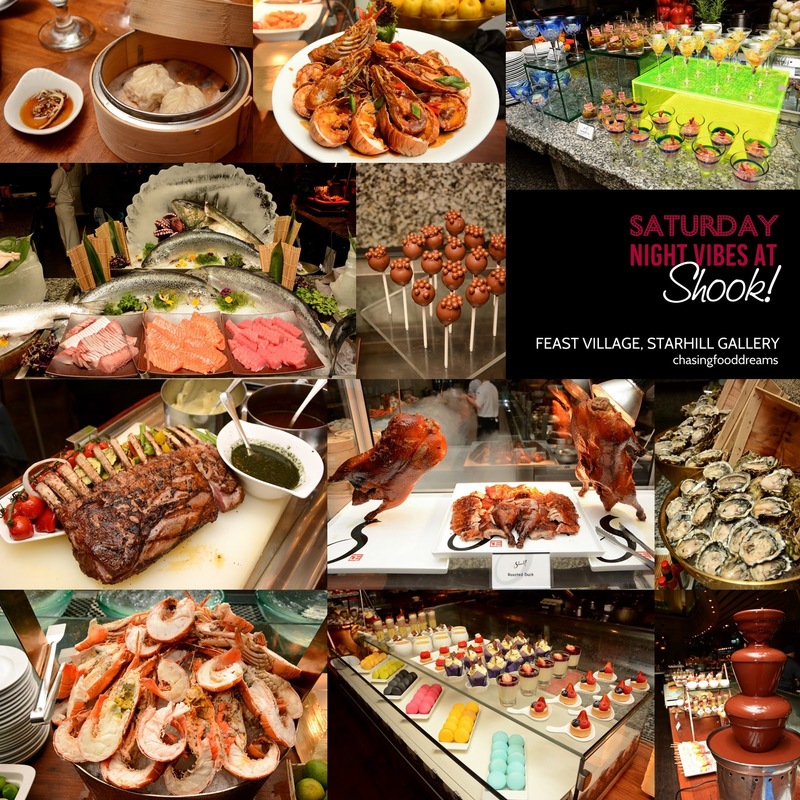 Shook!’s new dining concept, Saturday Night Vibes, is certainly making waves in town. 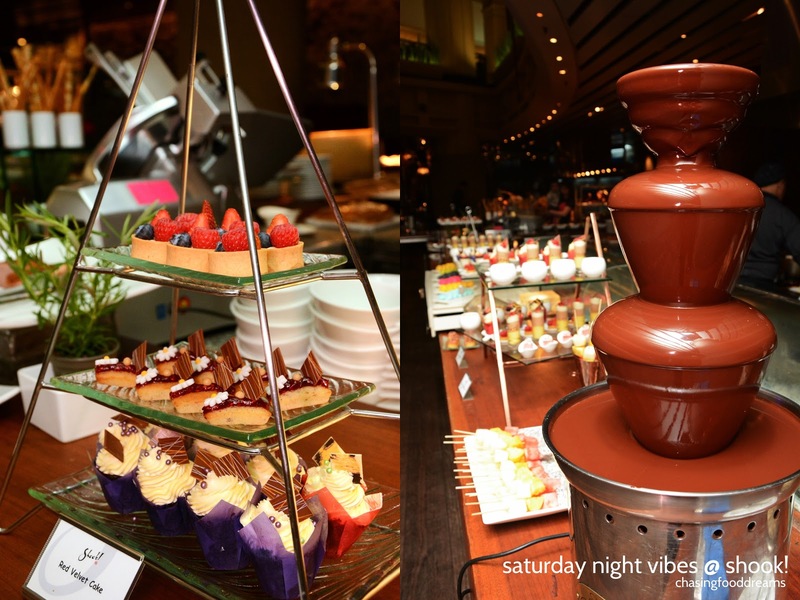 It’s a multi-sensory celebration of music, magic, a splendor of flavours and a little romance thrown in for good measure. “Shook! is more than just about the amazing food. 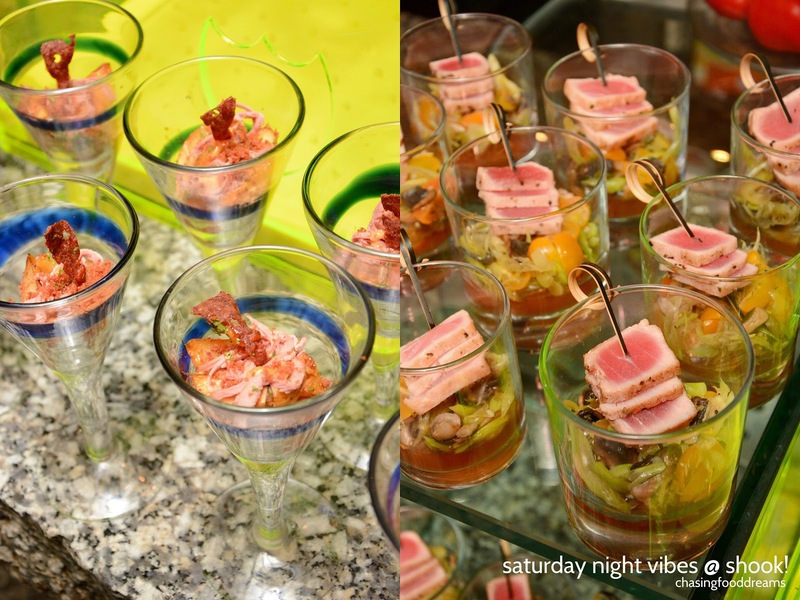 It is about the holistic experience where our guests excite all of their senses through a medley of curated expressions of self that include food, music and magic. A Cirque du Culinaire, this unique dining concept offers only the freshest ingredients from our various show kitchens; serves handcrafted desserts as you are being entertained by our very own magician, entertainers, and even clowns; and lets you begin your evening with good company. 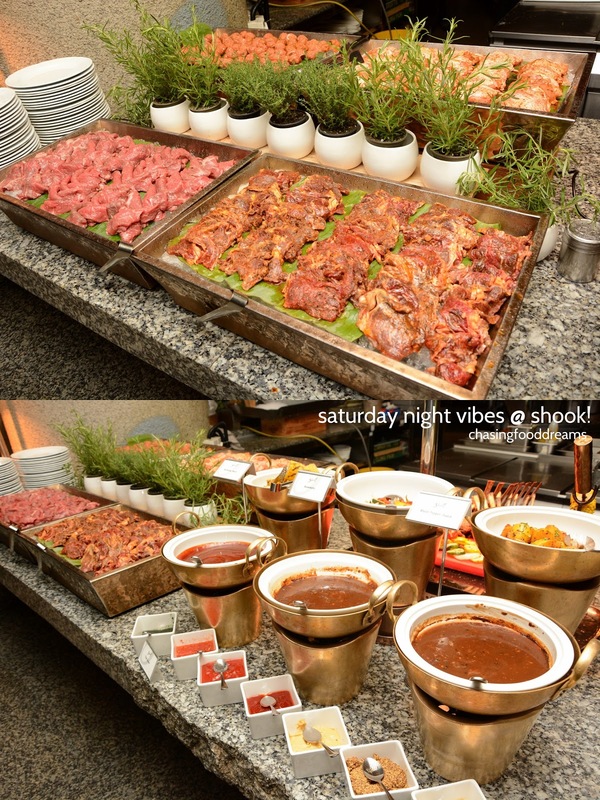 Saturday nights will be like never before as Saturday Night Vibes gets your weekend started on the right note,” said Joerg Hontheim, General Manager of Feast Village. Be enticed with a splendor of seafood on ice! From gorgeous Lobsters, Prawns, Crabs, and Scallops, there is also an endless load of fresh shucked Pacific Oysters, all ready to be savored with plenty of lemons and sauces. Watch out for the moving Roast station to enjoy glorious thick cuts of Rack of Lamb with Roast Vegetables, Mashed Potato, Miint Sauce and Gravy. The lamb is gorgeously pink with juiciness and tender. Fret not if you miss the Rack of Lamb, there is also a BBQ station when one can select your own meat and seafood to be grilled and served with various sauces. Hit the Chinese buffet for another load of seafood cooked in Chinese sauces. From Spicy Mussels to Stir Fried Clams, Slipper Lobster and Kam Heong Bamboo Clams to Roasted Duck, Hot & Sour Soup and more. There’s also little bites of dim sum from Yam Puff, Fried Dumpling, Crispy Squid and Sesame Ball. 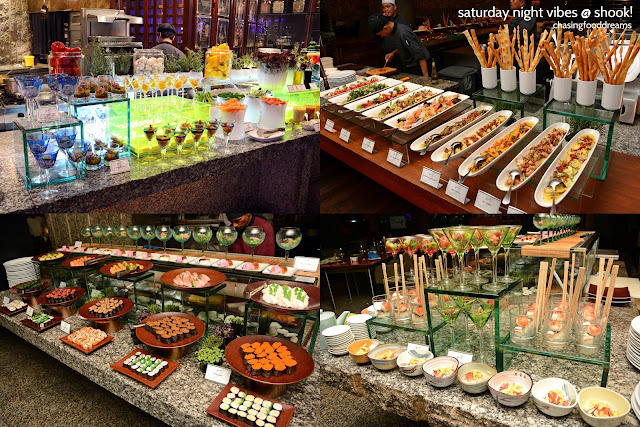 The Japanese bar will always be a favorite spot for some fresh Sashimi, Sushi, Tempura and Teppanyaki. There’s also some small bites of Japanese treat like Soba, Tataki and more for varieties. From East, we head West for a Mediterranean feast. Antipasti of Marinated Olives and Vegetables, Italian Seafood Salad, Baby Octopus Salad, Eggplant & Ricotta Salad Pepperonata Salad and more. 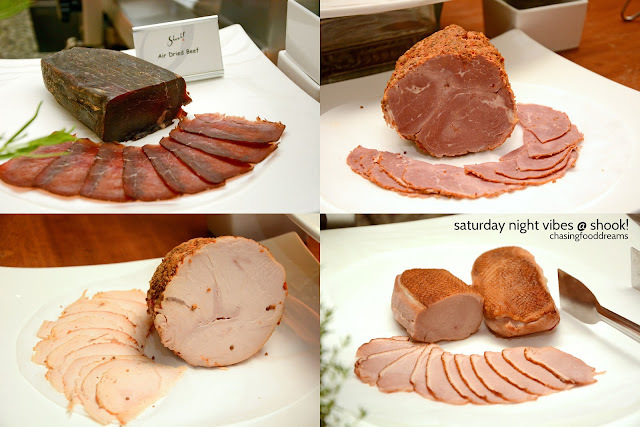 Savor thinly shaved slices of Air Dried Beef, Smoked Duck Breast and other cured meats along with breadsticks. The Seafood Risotto is simply a must-try! Each spoonful is absolutely divine and oozing with cheesy richness of bits of al dente rice coated in lusciousness. Besides the buffet bars, Shook! goes all out and serves more dishes, freshly cooked and served at tableside upon your order. 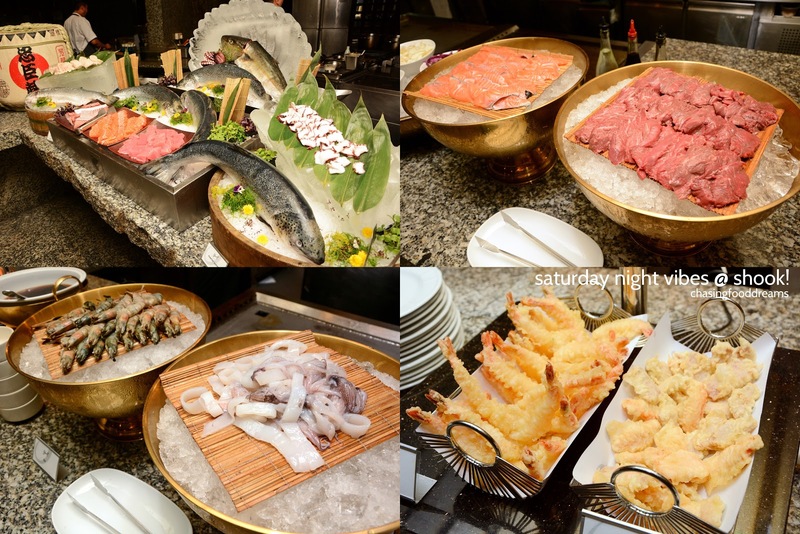 Xiao Long Bao, Bruschetta, Braised Beef Cheeks, Freshwater Prawn Sang Mee and Grilled Seafood are some of the dishes highlighted during our visit. Cheese lovers are in for a treat! From a solid list of hard cheeses like Manchego, Provolone, Pecorino Romano to soft ones like Brie, Roquefort, Goat Cheese and more, it’s a cheese galore. Despite all the tempting list of dishes to be savored, one simply must save some tummy space for desserts. Pretty French Macarons, Petit Cakes, Miniature Tarts, Mango Pudding, shots of Chocolate Mousse, Panna Cotta, Financiers, Cup Cakes, Chocolate Pops, Chocolates and the mandatory Chocolate Fountain are drool-worthy sweets to end the evening of gastronomical delight. Experience this remarkable dining concept every Saturday night from 6pm to 10pm at RM 168 nett. A beverage package is also available at RM 88 nett which comes with selected cocktails including the Signature Cocktail, Aperol Spritz, as well as other beers, wines and shooters (applies to diners of Saturday Night Vibes only) while the 1-for-1 Happy Hour is available from 9pm to 11pm - selected draft beers, house wines and cocktails are served. Contact Shook! Kuala Lumpur for reservations at +60 3 2782 3875 or shook@ytlhotels.com.my. 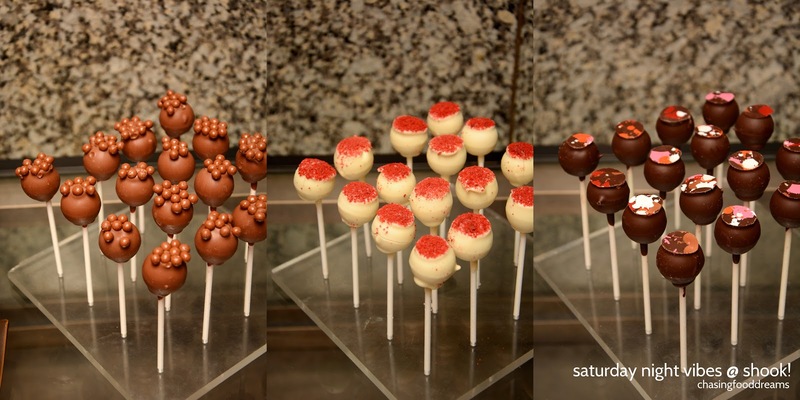 To make things even simpler when planning the weekend, guests can make reservations online on the website as well.